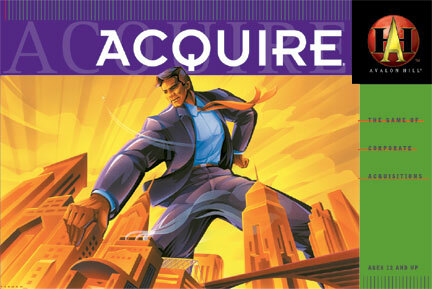 One of my favourite board games is called Acquire. It’s not a very flashy game. The board is a simple grid and alphanumeric tile pieces represent hotels that fit in the grid, but there is a lot of strategy, forecasting, and deception involved. The game is all about making money, investing, and being a hotel tycoon. You get the feeling and excitement of playing in the stock market and being part of high stakes mergers. On each players turn they must place a tile on the board, select a new tile from the excess pile, and have the option of buying up to 3 shares of any existing hotel chain. Hotel chains are created by placing a tile beside another tile. From there anyone can add more tiles to the chain. The more tiles there are on a chain the higher the share value. Players will have to determine if they want to keep the size of the hotel chain low so that they can by a lot of shares at a low price or build up the chain because they have the most shares of any of the other players therefore receiving the most money when they cash out their shares. Shares can be traded in for cash when a smaller chain is merged with a larger chain or they can be traded 2:1 into the new larger chain. When no more chains can be made or there are 5 existing chains on the board and a player decides to end the game all players will cash in their shares. Primary and secondary shareholders will receive bonuses on top of the value of their shares. The player with the most money after cashing in all the shares is the winner. What starts off looking like a very simple game becomes a game of strategy with huge payoffs. It’s a lot of fun give it a try.